One day, some of us would feel sorry that we never allowed as much trials in our lives as we needed. You don’t compare yourself to a sprinter, when you’re running a marathon. But that’s what the materialistic teachers are making us do. The Israelites LUSTED after food and pleasures in the wilderness, GOD granted them their lustful desires, but also sent LEANNESS to their SOULS. There were lustful operations and defilement within their souls, which GOD wanted them to deal with, but the Israelites would not. The degree to which our SOULS are getting SAVED from the world’s systems, and sin nature, to that degree can it be said that we are INHERITING our SOULS, And Are WEALTHY. But this perverse generation, addicted to pleasures, following after willful ambition, neglecting willing submission to GOD’s design, would never know the blessings of trials, and the weight of Glory’s attached to each obstacles we’ve delivered ourselves from. 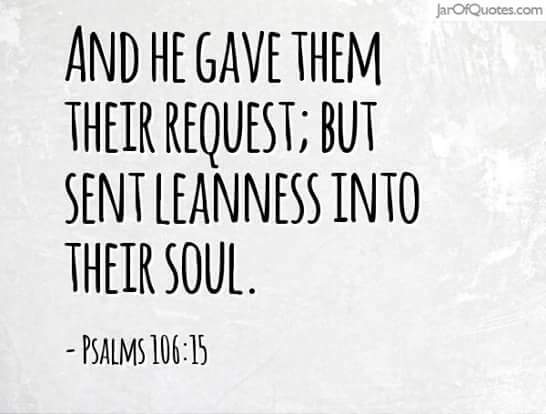 Now there is LEANNESS in our souls, and if we don’t repent, it’ll lead us where we don’t want to go. You need help not to be discouraged by the churches as they select some Old Testament and New Testament Scriptures that suits their varying purposes, and ignore those Scriptures that will call to questions the doctrines they teach. THE ONLY PERSON THAT I AM SURE WILL HELP YOU IS THE HOLY SPIRIT. Study the Scriptures to hear from GOD and walk accordingly, never study it so that you will win arguments. Finally: I first heard of the Holy Spirit from the Scriptures (Bible), and I began to walk as I hear Him through the Scriptures, then He also started talking to me directly, but He has never said anything that contradicts the Scriptures. The Devil also speaks to me, and whatever he says is eventually opposed to the Scriptures, and this is how I know that it is him that is speaking. I have had occasions where I said in my heart that a particular person that claims he heard something from GOD actually heard from the Devil because you will find so many Scriptures revolting and opposing his so called revelation. Please test all spirits, (it’s your inalienable right as a believer). You can trust the Holy Spirit not to raise your error detecting antennas excessively, and would not support you not reading the Bible. but may our Lord Jesus Christ see you, and I through victoriously. -From fellowship with Bro. Chimezie Asiegbu. Child of God, these are not days we can afford to be passive in the Christian faith! Those that do not ACTIVELY rebel against the system, including the worldly church system, will be swept away by the evil tide that is energising the system. THE TRUTH is the ONLY defence in these days. Pls love THE TRUTH. And obey THE TRUTH. With ALL your heart. ‘WATCH and PRAY’ is NOT an advice! It is an imperative for survival in these days. Please give heed to the words of Jesus Christ. • Everyone claims to be a Child of God; only GOD knows who His Child is. • No matter what the economy says; the wages of sin is still death. • Failure to meet God’s standard will pitch us against Him. • A day of favor is better than a year of labour. • Under Hard work; 30 days makes 1 pay but under Grace work; 30 pays is made in 1 day. • If you can’t offer a Pilot on duty alcohol, then don’t bother offering it to a CHRISTian; we’re always on duty. • Don’t bring GOD down, instead, go up to where GOD is and you will rise above principalities and powers. • Disobedience robs us of divine inheritance. • Our obedience must be total so that our generations to come don’t suffer the consequences. • GOD thinks in terms of potentials but operates by principles. • The love of GOD takes a man away from sin. The love of sin takes a man away from GOD. What is the religion of Adam? What is the faith of Abraham? What faction is the Holy Spirit? If you believe in the ideal truth. If you believe in the absolute truth. That there is only one truth, and all other versions are mistruths/untruths, then you’ll understand me, when I say that I am a believer who has transcended every form of religious partisanship, factions, and or groupings. I am not charismatic, protestant, orthodox, sessationist, or any of the factional tags that has been used to segregate believers. Despite your denominational inclination, if Jesus Christ is indeed your Lord, then to me, you’re brethren. I disagree with people only based on my understanding of scriptures, and not because they belong to a faction. NONE OF US KNOW AS WE SHOULD, NO NOT ONE. We all know in part and understand in part. At this, Joshua fell with his face to the ground in reverence. “I am at your command,” Joshua said. “What do you want your servant to do?”-Joshua 5:13-14. All the factions are product of FLESH. We will all do well, to drop them, and come on over to the Lord’s side. A man born of the Spirit is like the wind. Such is beyond any man made groupings, or fraternities, etc. Such functions as a member of A BODY. Remember; a city divided against itself cannot stand. If you understand the Unity that existed between the FATHER, Son, and the Holy Spirit, you will understand what we are called to, and how so far from it we’ve drifted all in the name of our fraternities, and denominations. THE PARABLE OF THE TEN ROOMS. This is how my parable begins. Let me call him John. John had a double story house, five plus five rooms. One day there was a gentle knock on the front door. When John opened, it was the Lord Jesus. “Please come in”, John pleaded, “I will give you the best room in my house – it is upstairs. Well, Jesus is a gentleman and said “thank you”. The next morning someone hammered against the front door. When John opened it, who was there? The devil. “No” shouted John, “I don’t want you here” But the devil said “I’m already in” – and a big fight started. Satan poured filthy temptation on him, it was horrible. By the evening John somehow got the victory and threw the devil out. Then he said “wait a minute”. I gave Jesus the best room in the house, why didn’t he come to my rescue?” Jesus said to John “Look, you gave me one of the ten rooms…” John was on his knees and said “I can see my mistake. Sorry, Lord. Let’s make 50/50.” Jesus is a gentleman and accepted. The next day was a repeat of the day before. Somehow the devil got in and out and John was totally exhausted. “Why didn’t Jesus come to my rescue today? I need to go and ask.” The Lord said “My son, why don’t you give me all 10 rooms and then, instead of me staying with you, you stay with me?” John broke down. He pulled the key of the front-door from his pocket and handed it to Jesus. Now, he had given it all. Some have given 9 rooms to Jesus and on the door of room number 10 they have written “Strictly Private”. It is there where they have their secret sins and live their double life. But Jesus cannot be cheated. C’mon. Let’s sing it together from the bottom of our hearts “Unto Jesus I surrender, unto Him I freely give….I surrender ALL, unto thee my God and Savior, I surrender all.” This is my foolproof recipe for victory. Does it speak to you? God bless you. I wanted to begin with a powerful anointing to do do miracles. Heal the sick. Give prophesies. See visions. But you know where God wanted me to begin? That lesson took us years; him to teach and me learn. It was hard, so hard, that I quickly stopped praying for meekness, the kind Moses had. If this was humility, meekness would wreck me. Or so I thought. I learned humility, but somewhere along the line, I let people take it from me. 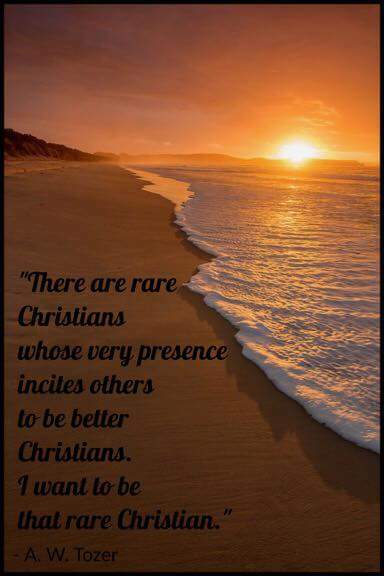 For these Christians, being truly like Christ was considered wrong, or a way of showing off. So I chose to forget my hard-learned lesson. I forgot how the humility of the God-King who washed his disciples’ feet, who said the leader MUST be as a servant, wh died amidst mockery, abandonment and disbelief. Even when he had at his disposal scores of angels to disperse, even destroy his enemies. I forgot he wanted me to be as lowly as child, if I want to be great in his kingdom. Because I wanted to be like men, not Christ. Thankfully, God reminded me once more of the lesson. And when I remembered, I told myself something, something so I won’t ever forget again. Eketi, you are nothing, except that which God has made, allowed and given grace for. You hear me? Nothing. Eketi, you’re the righteousness of Christ. Be that righteousness, whether it’s popular or not. If my being humble annoys you, please take it up with my Father. If you believe I’m faking being a good girl, take it up with Yahweh. He’s the one constantly moulding me into a good woman. I will not deny his work in my life. If only you knew how much of me he’s stripped away, until we got to this person you see. And there’s more stripping to be done. If you believe I’m holier than you are, brother, sister, no vex. See, in this heavenly race, overtaking is allowed. You’re free to holy pass me too….because na ahead ahead we dey go. In fact, holy sotey, e go pain me. Me sef, I go come fight make I holy pass you again. I don’t put up fake modesty. It’s not pride– it’s a fact. I fine die! It doesn’t mean that I don’t acknowledge that there are prettier, more beautiful women than me. I’m simply repping Baba’s handiwork. These days, it bothers me a lot when I meet Christians who believe that any rebuke or caution from another Christian is judgement. It’s kinda like years ago, when I had an anger management problem. Every time someone brought it up, I blew a gasket. I was developing high BP because I didn’t want to face the truth. Someone says, “Brother, you’re going the wrong way” and your first reaction is “Don’t judge me, we’re all sinners.” Then you fling Matthew 7:1 in their face. Judge not, that you won’t be judged. Excuse me, ma’am, sir, we’re not all sinners. I’m not, at least. I’ve been redeemed and I’m saved. I’m like, shouldn’t your first reaction be to check yourself? To see if the other party is right? Shouldn’t you give room that there’s no log in his eyes and if there used to be, that he’s removed it and now sees clearly? So you see, especially in church, there should be judgment. Being a Christian isn’t a piece of cake. It’s a long, beautiful and tough walk; one you must do every day. 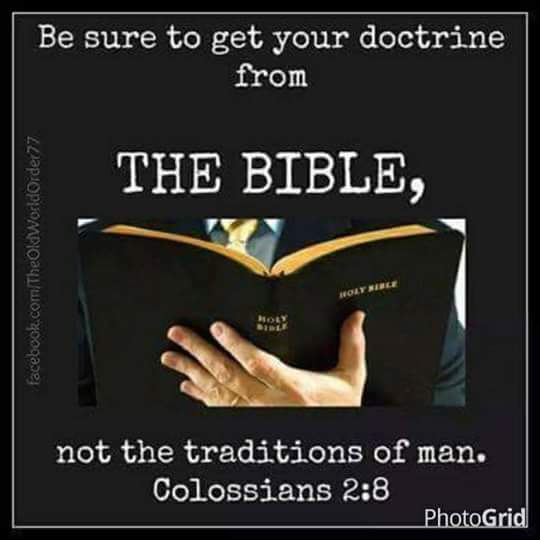 It’s even made harder by the many deceivers posing as Christians and the doctrines we have which oppose scriptures or seek to be superior to them. 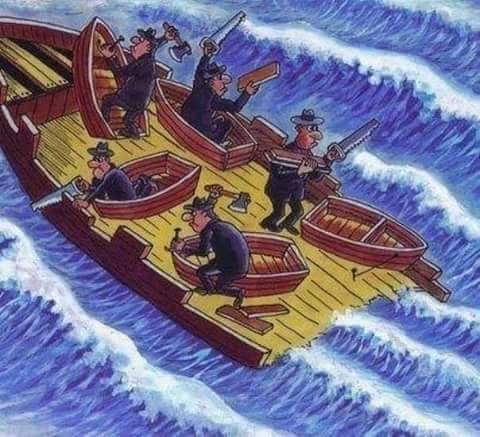 So if you’re blessed with people who care enough to tell you you’re towing the wrong path, search yourself first. 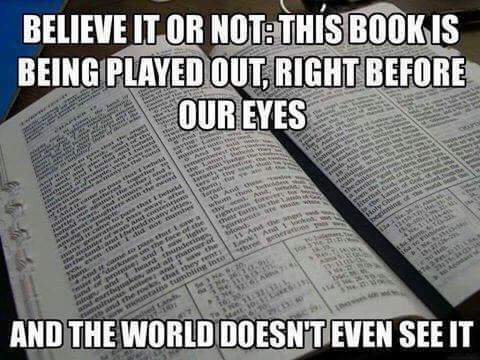 Search the scriptures. Ask the Holy Spirit to show you if you’re on the right track. If he says yes, carry on. Just don’t let your first reaction be a defensive one. Imagine Jacob come home to his family after having an encounter with GOD, limping. 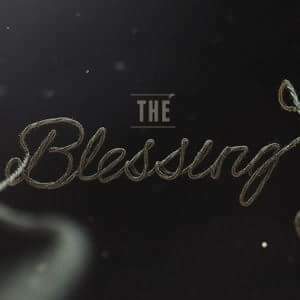 We need to RE-EDUCATE the church on what it means to be BLESSED. Did you see Peter come out of prison rejoicing?, I did too. But he wasn’t rejoicing because they let him out; His joy was because he was counted worthy to suffer for Christ. He thought that was a blessing. No, Esau was mad because Jacob took ‘the blessing’ – Something so intangible, it was worth EVERYTHING. Esau kept all of Isaac’s wealth, and remember, Isaac’s wealth was old money coming from the father of faith himself ~ Abraham. When Jacob returned from Laban, didn’t scripture say he met an Esau who had become a great man?, despite not having the blessing? People don’t necessarily need GOD or HIS Blessing to have wealth. Many people have left Christianity and the church to make successes out of their lives, whereas many have stayed in the Church and became wretched like poor Lazarus. The blessing is not money.